The congregation: United in voice and action, even in something as small as sharing a songbook. The combined children’s choir from the three Annual Conferences was a visible reminder of our oneness in Christ through their different coloured gowns. ATTENDING THE ALDERSGATE HYMN FESTIVAL this year brought a thought to my mind: “I am proud to be a Methodist!” Yes, I am proud to be a third-generation Methodist, one of 40,000 in our small island. We had humble beginnings: a Town Hall meeting conducted by the Rev James M. Thoburn and the Rev William F. Oldham on February 8, 1885. 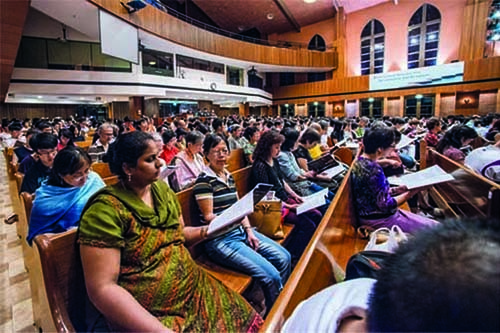 Now, on May 26 this year, the large sanctuary of Paya Lebar Methodist Church was filled to capacity by Methodists from all walks of life, called to come together by God’s grace. This year’s Aldersgate Hymn Festival celebrated the 275th Anniversary of John Wesley’s “heart-warming experience” at Aldersgate Street. Its theme was “Called Together by His Grace”, and was based on Galatians 5:22-23. The Rev John Wesley, a son of Anglican priest Samuel Wesley, was primarily a preacher, teacher and organiser. His teachings all had scriptural basis. He and his brother, Charles, studied at Oxford University and gathered round them groups of disciplined students who prayed and studied the Bible; hence they were nicknamed “Methodists”. The influence of the Wesley brothers on our way of worship could be seen in the festival programme, which took the form of a church’s “Order of Worship”. There were prayers and dramatised Scripture readings, interspersed with the singing of hymns composed by Charles Wesley as well as other modern hymns. The congregation participated in singing several of the hymns. 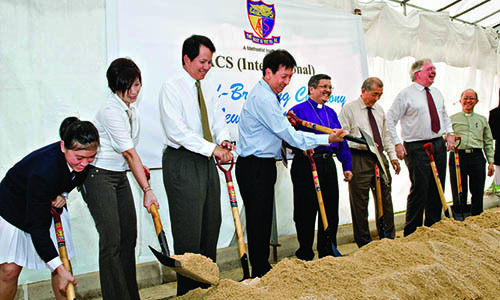 The festival was organised by the Methodist School of Music (MSM) headed by Dr Evelyn Lim, and was crafted by Ms Judith Laoyan-Mosomos of MSM. 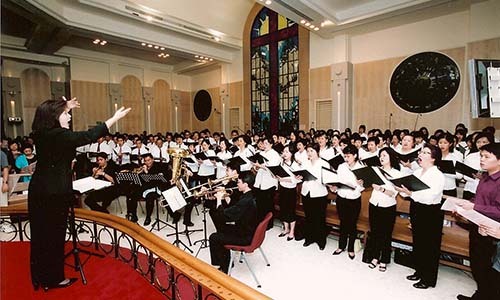 It featured a combined choir from the three Annual Conferences under the baton of Mrs Wong Lai Foon, with Dr Evelyn Lim at the organ, Mr Samuel King at the piano and the small Festival Orchestra and MSM Handbell Ringers in attendance. The evening began with an instrumental prelude by the guitar maestro, Mr Ernest Kwok. He played “How Great Thou Art”, an inspiring hymn, beautifully using the fingerstyle technique. Bishop Dr Wee Boon Hup opened the festival with words of welcome, followed by the rousing introit “Rejoice, The Lord is King” sung by the Festival Choir. 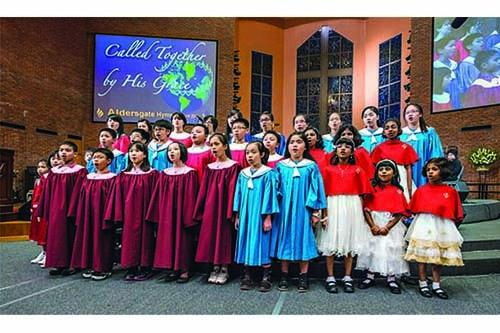 Each of the three components of the Festival Choir – the Chinese Annual Conference (CAC) choir, the Emmanuel Tamil Annual Conference (ETAC) choir, and the Trinity Annual Conference (TRAC) choir – also sang hymns in Chinese, Tamil, and English respectively. The smallest seven-member ETAC choir gave a creditable performance, singing with gusto. Not to be outdone, the Festival Children’s Choir, accompanied by Ms Lily Wong on the piano and the MSM Ringers, raised their angelic voices and sang their hearts out with their rendition of Charles Wesley’s “Praise the Lord Who Reigns Above” and Mark Patterson’s “Lord, We Are Your People”. The instrumental rendition of “Great is Thy Faithfulness” was performed by two talented young musicians, Dr Luke Ho on the violin, and Mr Samuel King on the piano. The duo gave a virtuoso performance with Dr Ho playing with verve and heart to bring life to the lyrics of that great hymn. It was encouraging to see a youthful contemporary band from Kampong Kapor Methodist Church lead the congregation in a reflective worship song, “There is an Everlasting Kindness”. Alternating between singing in English and Mandarin was no mean feat, but Ms Stefanie Mok executed it beautifully. This bilingual singing was also attempted by the congregation throughout the evening, and could have echoed Jesus’ disciples’ first experiences of speaking in tongues. The respective CAC, ETAC and TRAC Presidents, the Rev Dr Chong Chin Chung, the Rev R. Prabhu and the Rev Dr Gordon Wong, oﬀered “Prayers of The People” before the freewill oﬀering. The Oﬀertory Anthem “His Grace Will Lead Us Through” was sung solemnly and with passion by the Festival Choir. The festival came to a close with Bishop Dr Wee sending the congregation forth with words of exhortation for God’s grace and the empowerment of the Holy Spirit. What could have been more fitting than to end the day with Charles Wesley’s famous “And Can It Be”. Just as our Bishop’s heart was warmed by the Aldersgate Hymn Festival, so was my heart greatly warmed to be part of the congregation of Methodists in Singapore, called together by God’s grace. 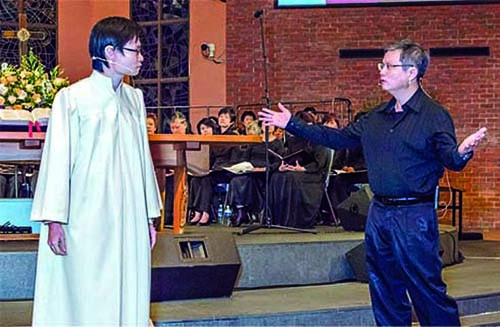 Pastor Benjamin Lee (left) from Faith Methodist Church and Mr Yeo Teck Beng from Telok Ayer Chinese Methodist Church gave a lively dramatisation of Matthew 25:31-46. 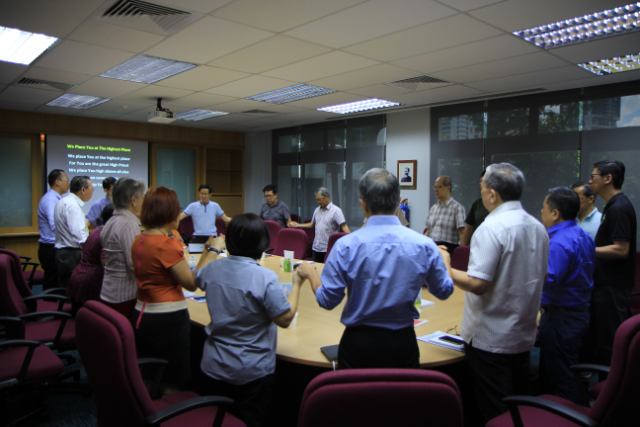 Dr Tong Hoo Ing is a volunteer with Methodist Message and worships at Wesley Methodist Church. 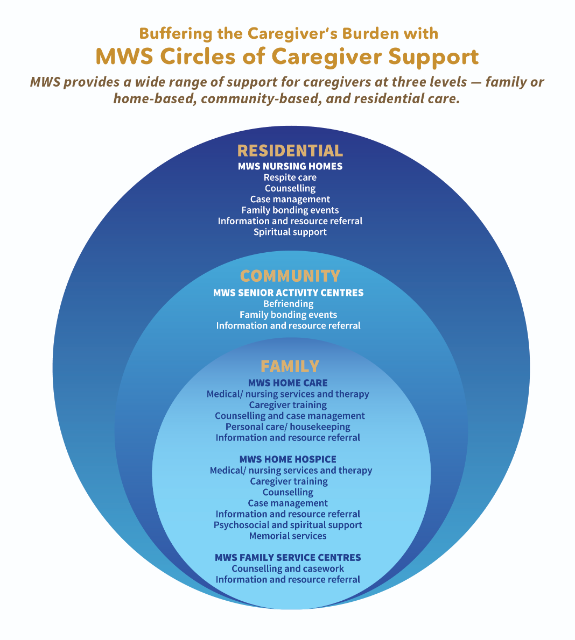 A retired neurologist, he also volunteers with Bethany Methodist Nursing Home.